China urges Caution on Syria, wants to wait on the U.N.
WASHINGTON — After the U.S. almost assured the world it will enter the Syrian civil war against Bashar al-Assad, China is urging caution on all sides. Reuters reported that China, which has backed Assad’s Syrian regime along with Iran and Russia, said that no action should be taken before the United Nations investigates chemical weapons claims. 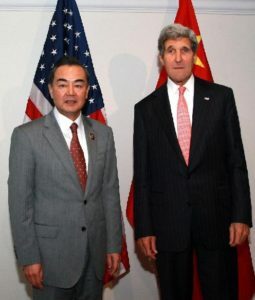 China’s official Xinhua news agency, run by the Chinese Communist government, said that the country’s foreign minister, Wang Yi, told U.N. Secretary General Ban Ki-Moon that China wanted an independent and objective investigation without outside pressures. Wang was quoted as saying, “a political resolution is still the only way out,” even when China and Russia have stopped any significant relief action or political solution from succeeding at the U.N. Security Council level. This comes as France offered support for the U.S. to intervene in Syria and as Hezbollah, Iran and Russia support the Syrian government regime under Bashar al-Assad. U.S. President Barack Obama has waffled on his “red line“, where he told the international community that the use of chemical weapons in the two-year-old civil war will lead to U.S. involvement. The United Kingdom’s parliament rejected intervention and put Obama and France in a tough spot.